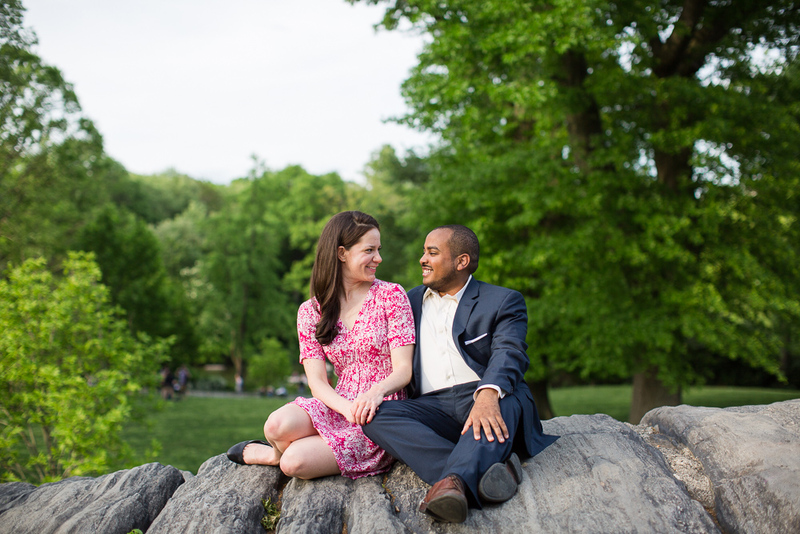 This Central Park engagement session with Brandon and Jill was definitely one for the books. I’m originally from New York, so I’ve photographed tons of engagements and weddings around the state, but this was my first chance to do an engagement shoot in Central Park! Brandon and Jill are getting married in Virginia this fall, but they’ve recently relocated to New York City. And since traveling for photography is something that I always love to do, meeting up in NYC for their session was just perfect! These two have had a lot of fun exploring their new city and one of their favorite spots is Central Park, so it was an easy choice when deciding where to do their engagement photos. We started the session off at the iconic Bethesda Terrace. You might recognize this spot from movies like Home Alone 2 or Elf! The focal point is of course the giant Bethesda Fountain, but the staircase and arches made for amazing photo locations too. And although the place was packed with people, I’m so happy with how we managed to get pictures of just Brandon and Jill (although there were definitely plenty of shots I deleted with tourists walking in the way haha). I love the way that they look at each other! As we left the Bethesda Terrace and continued our walk, we stumbled across some white and pink flowering bushes. It was the perfect backdrop to match Jill’s dress! She could not have coordinated this any better if she tried. Our next stop was the Bow Bridge, another iconic Central Park location. We only covered a small fraction of the park, but everywhere we looked was another beautiful spot for pictures! And we wrapped things up back where we started, with a couple final shots by the Bethesda Fountain. I’m so glad I got the chance to visit New York City and spend the afternoon with Brandon and Jill. Can’t wait for their wedding in a few months!